Looks like my internet is especially poop before lunch and around dinner. Going to expand the data collection to several different locations in the US and remake the chart (at a later date.. i don't feel like messing with it for a bit). 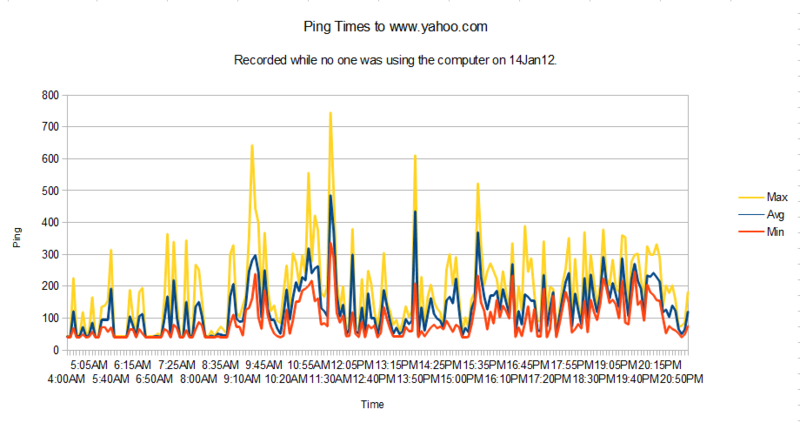 The chart was made from data collected every 5 minutes from 4am to 11pm today which comprise 199 logging events consisting of 5 pings to www.yahoo.com. The pings are summarized into minimum, maximum, and average times.